The fastest growing sports Longboarding is very popular now and people are really using it to getting around and having fun. Longboards were invented n Hawaii by surfers in the 50’s to just practice when the waves were not cooperating. Now it’s fastest growing sports and people are really enjoying it. If you are also going to buy longboard for you then it’s really good but it can be hard to know which one is best. Obviously, when buying something with moving parts, like a longboard, it is important to ensure that the item is made from quality parts as that will ensure that you are safe when using it. It is also important to check that the product you are going to buy is the best product available as you are going to use it daily. So there is no sense to buy without researching a little, to help you with that and making process of buying longboard easier we have done the hard work and listed the best longboards below. You can check the best longboards available here. Why You Should Buy a Longboard? Longboarding a very interesting and fun sport but not everyone gets a good start with it. You might end up injuring yourself if you don’t get a longboard that’s suitable for you as a beginner. So you should keep in mind few things before purchasing the Long Board. Checking the board style is must as flexible drop-through make the longboards more stable and easier to push. It will help you to getting around easily. Traditional Cruiser boards are smaller and easier to navigate. Also check for the deck length and deck flexibility as it is also plus point for best long board. Another important thing in the longboard is wheels as it’s really wise to check the wheels are suitable to the board or not. Like if you are buying longboard with longer deck the bigger the wheels need to be. If you are little bit heavy then buy the longboard with harder wheels. With the help of good skateboard bearings the longboard wheels spin without being affected by the friction. But if you are buying a good longboard after checking the wheels then it will come with good bearings. Also the standard ones are good to go for so there is no need to spend too much on bearings. But still checking for rating of bearings is good it will give more satisfaction. First board on the list is Atom Drop Through Longboard. 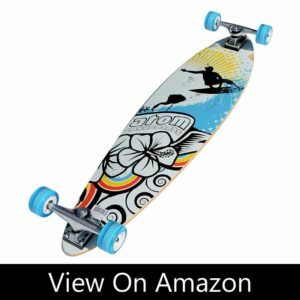 It’s 40 Inch long board and best longboard for beginners. The deck is composed of eight layers of maple laminate. It’s a drop through model with cutouts above the wheels, so it doesn’t sacrifice wheel clearance for stability. It comes with 50 degree base, 7 inch aluminum hangers, heat treated crmo axles and grade 8 king pins. The wheels of this board is 70 mm diameter by 51 mm in width. However the pro riders will not find this board too much attractive as they want speed and you can’t go more then 20 mph. Because of it’s wide deck you will get a comfortable riding experience and also because of it’s cutout style you’ll never have to worry about wheel bite. It comes with rubber shielded ABEC 9 bearing with high speed lubricant which is really super fast. 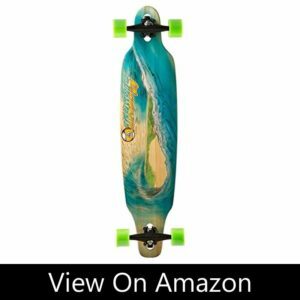 This long board is really good and it you are looking for the best longboard under $100 then this board is for you. This 36 inch longboard is best for you if you are beginner or learning the longboarding. 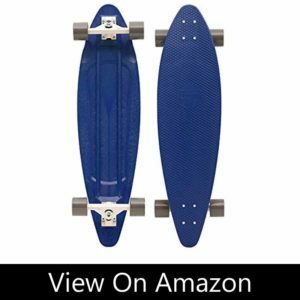 It is super flexible and affordable longboard. Like other longboard this is not made of wood as it is made of plastic and deck is made like pintail shape. The longboard looks cool and made quality is very good. The wheels are soft but they don’t create any problem while riding. Also it can gather the speed in less time and you will enjoy the moment for sure. If you don’t want to spend so much money want a budge friendly longboard then it’s highly recommended. Also it’s best for beginners as previously said still it’s best for pros too. It best longboard under $100 too so hurry up and buy one now. 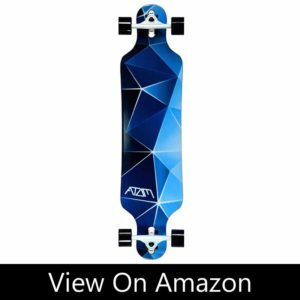 Wanna buy best longboard for downhill? Yes, then believe me this versatile Quest super cruiser longboard is made for you. It’s 44 inch longboard and it’s best for those who are just started to learning the longboarding. The best part is it’s wheels which are perfectly made not so big and not so short. It comes with Genuine ABEC 7 speed bearings, 7 Ply Super Flex Bamboo and Hardwood Maple Deck, 7-inch aluminum trucks. By paying that less money you will get a pro style longboard and this longboard deck is made of ORIGINAL bamboo. It is also somewhat flexible which will help you to not to hurt your ankle and knee while riding. Without any second thought it is best for beginner or intermediate rider you can just buy it and start riding. Well this board is advanced then previous listed longboards. Because it is specially made for downhill riding, but there is no condition like beginner or advanced can’t use it. It’s best for these too and some of them are really liking it. This longboard is made from five plies of laminated bamboo and it width is 9.6 inches and length is 42 inches, which makes it more interesting. Because it is not that long which will bite the ride or not that small. Next best thing about this longboard is wheels which are 74 mm in diameter with a hardness rating of 78A. It comes with PDP Abec 5 bearings but if you have better bearings then you can change but that is not a big deal. It’s perfect for cruising, hills, curves and slopes and if you want to do the tricks on flat ground then you can buy this. This is little bit costly then the above listed boards but it also provides more. 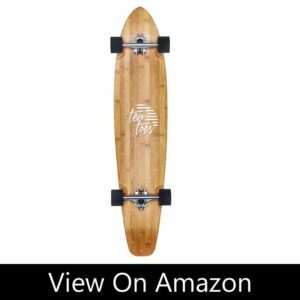 If you are looking for the best longboard under budget then Atom Pin Tail is best choice for you also it’s best for you if you are just started or starting longboarding. It comes in classic pintail shape and it’s best longboard for cruising. It aluminum fitting on the board makes it more durable and make the ride more interesting. The best thing about this board is color and design we like it very much and you will too. It come with 8.5-inch aluminum trucks, ABEC 5 bearings and 78A urethane wheels. The longboard is 39 inchs in length and 9.4 inches in width. Best thing about this longboard is that you will not face wheel bite problem. It is best longboard if you want to grab attention of other people also while spending less money. It is made for last long and you will not face any crack or damage even after 1-2 years. You should really try this if you budget of $100. 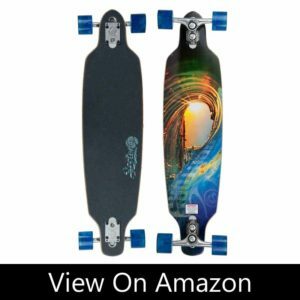 Sector 9 Fractal is a 36 inch long and 9 inch wide board which is short length for longboard. It comes with 9″ Gullwing Sidewinder II’s and 69mm 78A Sector 9 top shelf wheels with PDP Abec 5 bearings. With Gullwing sidewinder you will have the best ride ever and it can do great job on the hill too and as it is made of straight road but you never face problem on hill. Also kids can ride this board too, this is not longboard but it will give you feel of longboard for sure. The only thing you may not like is bearings ABEC5 bearings are okay but not that fast. You can upgrade it buy replacing it with better bearings in only $12-15. It’s best drop through longboard and with it’s 8 ply maple it will last long. Made with bamboo this longboard can give faster speed and best riding experience. This 44-Inch artisan longboard made from beautiful bamboo and it is little bit heavier then others as it’s weight is near 9 pounds. It have durable maple in an 8-ply construction which made it extra stronger. It is crafted from natural materials. It comes with 70mm wheels which are smooth as butter and it comes with ABEC 7 bearings, and hard wheels that further its speed. There is no problem like wheel biting as they included wheel wells to eliminate grab. It comes with 10 different color and design and believe me you are gonna like every one of them. I afraid to say that it will not suit the beginner as it can go really fast so the beginner can hurt him/herself. But if you handle that then you can go with it. Longboarding is an adventurous sport and quite popular among youth(especially teens), while their dozens of longboard available in the market every board has a different purpose. 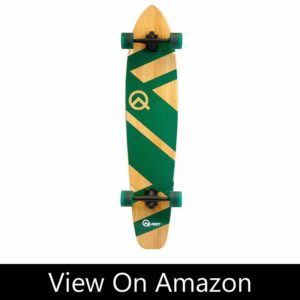 There are longboards available for downhill, cruising, freeriding, etc. Longboards also come up in different shapes and sizes, so you know about them in order to go for a purchase. As the name says these longboards are suitable for riding down the hill. These longboards are made of the finest quality and make the riders experience amazing. One of the major issue faced by riders while downhill riding is speed wobbling, which is completely eliminated in high-quality downhill riding longboards. Attaining perfect isn’t that hard in these longboards as they have well-defined front and back part making longboarding on straight line easier. This board will smoothen your journey down the hill. Caving is one of the most famous techniques among longboarders and every rider wishes to learn this. With regular practice its not hard to master carving. You can pass any obstacle easily in a smooth way after learning this technique. Carving Longboards helps you to take turns in an efficient way without any issues. The Atom, Sector 9 are few famous manufacturers which produce the finest quality of carving longboards. Let’s bring it directly, these longboards are best suited for relaxed longboarding. With the attractive designs, these longboards have got a solid build too. Drop Trough longboards are better known for its stability and as you need to stable in order to have a relaxed ride. These longboards are a lot famous in youth as they can be used anywhere and available for cheap also. As the word cruise means traveling smoothly at a moderate speed. This longboard serves the same purpose. Cruising longboards were built for crowded places and are mostly used for short distance travel. Due to the wider trucks installed in these, it makes the longboard exceptionally stable. Our team recommends cruising longboards to beginners as they are a lot stable so it helps in maintaining a perfect balance. Bamboo longboards have started to gain popularity among the young due to its light weight and flexibility. These longboards look great and are a cheap too. Bamboo longboards are suitable for carrying to different places like if you are going out for a picnic or a trip. These longboards are completely organic and due to its flexibility, you can perform great tricks too. The only drawback of a bamboo longboard is the wheels as they are really hard to replace if they get damaged. Pintail longboard are wider in the center and goes pointed towards the end i.e sharp nose and tail. These boards come with carved out wheels that reduce the risk of wheel bites. Due to the design of the board, they are best for riding directional and helps to improve the balance. You can take sharp turns as sharper tapes help improve the turning radius. So, if you want to ride directional and take sharp turns then you must consider this board. Fishtail longboards are quite similar to pintail longboards in design i.e wider in the center and sharp nose at the end. Fishtail longboards differ from pintail only due to the split tail which not only gives it a split tail surfboard, but also makes the experience riding it like surfing. Fishtail longboards are suitable for long rides and taking sharp turn. Mini cruiser longboards are not considered longboards technically as they have a length of 33′ or less. Mini Cruiser boards are suitable for professional riders only as they offer high speed and better turning ability due to its short length. A beginner might find it difficult because of less stability offered by the board, so make sure you master the skills first before buying Mini Cruiser Board. Blunt Longboards are known as beginner’s friendly longboard due to its design. This board is wider in the center and has a round nose and tail, which provides better stability. The longboard has less clearance which makes it difficult to take a sharp turn. So professional riders never prefer this board. Due to its design and poor turning ability a beginner might find it a lot useful to master the basic longboarding skills. Twin skateboards were introduced for multi-directional skating. Later on, twin longboards were launched with wider sides as compared to twin skateboards. Twin longboards are best for freestyle riding as the board provides amazing stability. This board is widely used for learning new skills. If you are planning to buy twin longboard make sure it comes with soft wheels so that you can perform amazing tricks easily. Drop down longboards comes with a lower deck and nose which adds on to its stability. This board is suitable for long rides as pushing becomes easier. These boards are paired with cut-out shaped decks to provide wheel clearance and avoid wheel bites. Speed Board Longboards are used to speed riding and they provide higher stability at high speed also. This board comes with a high-speed friend design which makes sure you don’t compromise with speed. Cut Out Longboard comes with the most wheel clearance than any other board available. Even these boards offer a bidirectional ride which helps the rider to ride normally or switch without any difficulty. These boards come with drop through trucks in order to lower the longboard and adding stability to it at higher speeds. Riders choose this board for downhill riding, freestyle riding, etc because of the larger wheels and easy turning ability. Well here are so many other things are available which can make your life enjoyable so why you should buy longboard? Well I know this question is stuck in your mind, don’t worry here is the answer for this. There are so many benefits of longboarding and it’s best for so many other things. Let’s have a look at the advantages and benefits of longboard. 1. Longboard is easy to carry, it’s up to you when to walk and when to ride. Longboard is faster then the skateboard and it gives a gentle ride. 2. Longboard also helps to exercise while longboarding as it can help you to lose fat and also improve muscle mass. 3. Longboard is suitable to all age people. Everyone can ride it and you will also get ultimate fun while riding it. 4. Longboarding helps you to improve your balance and it also improves the coordination of your body organs and systems. No doubt that it strengthens your muscles, your ankles, knees and improves your posture.